Twitter has been full of comments the last couple of weeks about the issue related to switching a site from HTTP to HTTPS and the resulting traffic loss from Google. Gary Illyes from Google made a comment on Twitter today saying that SEOs who recommend against going HTTPS are wrong. One of the biggest concerns webmasters have with switching to HTTPS – aside from ad revenue loss – is the potential to lose rankings during the migration, especially if those rankings are lasting several months like many webmasters have been reporting. He then follows up and says that there shouldn’t be any long term negative impact for making the switch. 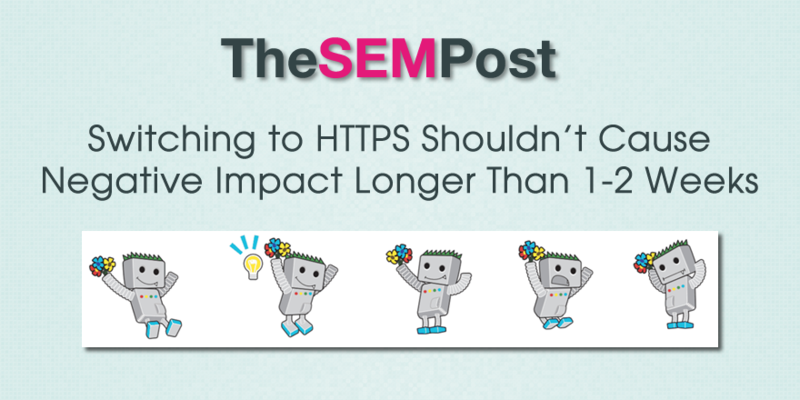 But how long should SEOs see a negative impact as a result of switching to HTTPS? Gary Illyes is saying that “one week is understandable, two weeks, with a stretch” for things to go back to normal, and any longer than that, he would raise an eyebrow at. This is something that I have noticed more recently where SEOs are now changing their stance on whether to switch a site to HTTPS or not, due to the resulting traffic loss which does seem to take a few months to correct itself. While there is the boost associated with HTTPS, it is pretty minor and Google has repeatedly said it acts more as a tie-breaker, at least at this time. However, anytime someone makes changes to their URL structure, whether it is a result of a CMS change, changing URL formats or one of the many other reasons someone might choose to change URLs on a site and redirect the old ones to the new ones, there will also be a resulting traffic loss while Google sorts out the new ones. But having only a 1-2 week fluctuation period is a lot shorter than what some are reporting in practice. Also, complexity and size of the site will also make a difference. A three-page local business site will likely see their rankings bounce back much quicker than a site the size of Wikipedia. Rand Fishkin recently posted on Google+ about changing Moz to HTTPS and the resulting 3 months of dropped referral traffic from Moz. However, Moz also made changes to mobile-friendliness at the same time, and it is also harder to determine if something else is in play as well, such as an impact by an algo change unrelated to the switch to HTTPS. Not to say HTTPS is the wrong move; for most sites it's smart. Just know rankings & traffic may take a few weeks->few months to recover. Justin Briggs also noted a dip in the 4 clients he has migrated to HTTPS, and he saw a 5-10% dip for 2-4 weeks. This would bring it a bit closer to the timeline Gary Illyes is saying. @veezy 5-10% for a couple of weeks (2-4). They indexed fairly fast. So in theory, if webmasters are seeing a negative impact lasting beyond the 2 weeks, then there could be an issue where something has gone awry with the HTTPS implementation and migration process. This is something that others have seen, when there are problems related to a botched job on the redirects or other migration mistakes. @methode I've seen several ppl botch the redirects when switching and others lose 5-10% of traffic. @Marie_Haynes I've seen some weird cases, but haven't seen a site jump due to https. I have seen the opposite, due to migration problems. For those making the switch, making sure you submit accurate sitemaps for both http (if you haven’t added one previously) and https with the new redirects in place should help speed up the process. However, with the complexity of making the change for some sites, it is too bad there isn’t a related tool in Google Search Console that will help webmasters identify problems related to the migration quicker, especially for sites that may have additional signals required, such as hreflang support or complex structured data that somehow gets missed or changed during the migration process… sometimes webmasters need saving from themselves, especially for those who might be migrating a site for the first time. So while you will likely see a dip in traffic when switching to HTTPS, since you are changing the URL structure of the site, if it lasts longer than 1-2 weeks, you should probably start looking at other migration issues that could be causing the site traffic to not bounce back to pre-HTTPS change levels.